Following the previous weekend’s snow-enforced postponements, Market Rasen Town Under 16s returned with a fixture double-header. On Saturday, Rasen travelled to Heckington, and after a solid start, a mix-up in midfield let the hosts through to score with their first chance. The visitors dug in and fought back well, going close when Timmi Temison’s solid header hit the bar. And soon after, Eric Blair’s overhead kick had to be tipped over the bar by the Heckington keeper. But the pressure was short-lived and the home team attacked again and went two-up, and the third soon followed. Rasen then got back into the game again and scored through Dan Bailey to make it 3-1 at half-time. Heckington added a fourth early in the second half before Bailey got his second. But just as it looked as if Rasen would get something from the game, errors allowed Heckington to dominate and race into an 8-2 lead. Ryan Car headed in from a corner, while man-of-the-match Timmi Temison had a late chance, but the damage had already been done. 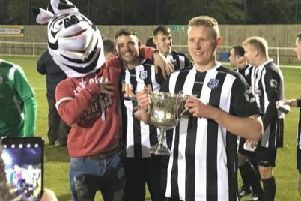 Market Rasen responded superbly just 24 hours later when they entertained North Lindum Hawks on a very soft Rase Park pitch after further rain. Still smarting from the previous day’s defeat, Rasen started quickly and didn’t give Lindum chance to find their feet, firing efforts at goal within the first couple of minutes. And they didn’t have to wait long for their goal as Bailey scored with a sweet strike inside the first 10 minutes. Bailey soon added his and Rasen’s second, and midway through the first half the hosts scored again, this time through Timmi Temison’s neat finish for his first goal of the season. Sloppy play towards half-time saw Lindum capitalise and pull one back to make it 3-1 at half-time. Lindum come out stronger for the second half and attacked Rasen from the whistle with a couple of shots on goal. But Rasen held strong and, after 10 minutes of pressure, took control again. They made it four midway through the half from a corner which Bailey swung into the box for Sancho Jackson to head home his first of the season. Rasen continued to dominate the remainder of the game and scored a fifth when man-of-the-match Bailey headed in after a mistake by the Lindum keeper. The home side kept pressing for more goals, but the game finished 5-1.